How Can I Go Full Circle Bookstore? Where is Full Circle Bookstore in Oklahoma City on the Map? You cannot even imagine our joy at finding this book store! My daughter and I love to read and bookstores are a favorite hangout. We were visiting OKC from Texas and came across this gem on the internet so decided to go check it out. My daughter (18 years old, btw) jumped out of the car and went RUNNING into this book store and I literally did not see her for 30 minutes! So many books and the atmosphere is how a book store should be! I cannot wait to bring my granddaughters up to see this place. The children's section is unbelievable! Warm and inviting, I could stay here for hours, days, weeks!!! We will gladly make the trip from TX again and again to shop here! Very cool environment, really cozy, picturesque, and an excellent date idea. Walked inside to hear music which I thought were playing through a speaker system but turned to notice there was an actual group of musicians playing strings. I don't read as much as I'd like to so I can't give much of a review from an avid reader's perspective, but I very much enjoyed my time browsing the shelves. Wonderful, attentive service. They had exactly the book I wanted to complete with my dad to preserve his memories for his posterity. great ambience, great selection of books. local selections too. This store was GREAT! I had so much fun exploring a traditional book store. I also visited the children's section and it was incredible. 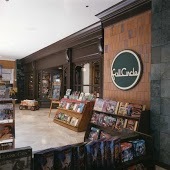 It was a bit crowded and scattered in topic, but this is one of my favorite books stores.